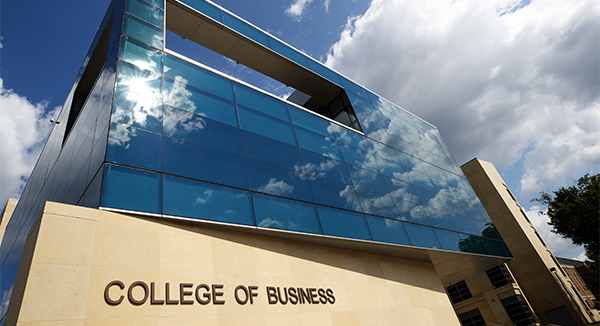 New College of Business building named Howard L. Hawks Hall. The Board of Regents is expected to approve the designation in honor of the Omaha businessman, philanthropist and longtime regent at its Aug. 11 meeting. Howard L. Hawks Hall, which will be the new home for Nebraska’s College of Business, formally opens later this month. The 240,000-square-foot building at 14th and Vine streets will provide a place for innovative teaching and high-level research at Nebraska Business. The facility features experiential learning spaces and high-tech classrooms to increase opportunities for students, faculty, staff and alumni. Hawks speaking at College of Business building groundbreaking ceremony in 2015. Hawks is a Nebraska alumnus, a recipient of the college’s Lifetime Achievement Award and the founder of The Hawks Foundation, a key vehicle for charitable giving that his wife, Rhonda, leads as president. The Hawks took a leadership role in supporting the privately funded, $84 million building and championing its fundraising initiative, but have requested that their gift amount remain undisclosed. “Howard Hawks has encouraged us to be bold in our aspirations. This building was a bold goal that Howard and Rhonda have helped us achieve,” said Donde Plowman, executive vice chancellor and chief academic officer at Nebraska, who was dean of Nebraska Business from 2010 to 2016. “Their lead gift inspired other alums and partners to step forward to make this dream come true." Donde Plowman (left) with Jane and Ronnie Green and Shawn Eichorst. A Nebraska native, Hawks is founder and chairman of the board of stakeholders for Omaha-based Tenaska, one of the largest private, independent energy companies in the United States. Tenaska has a 30-year record of success in development, design, financing, construction management and operation of electric generating facilities. Tenaska’s natural gas marketing affiliate, Tenaska Marketing Ventures, is among the top five natural gas marketers in North America and in 2016 it sold or managed about 13 percent of the total U.S. natural gas consumption. Other Tenaska affiliates market electric power and are involved in private equity investment management and acquisitions, and natural gas exploration and production. Hawks was first elected to the Board of Regents in 2002 and was the board’s chairman in 2005 and 2014. Hawks’ other notable major gifts to the university include contributions to an endowed chair in business ethics and leadership in the College of Business, Nebraska’s baseball field at Haymarket Park as well as an indoor athletic facility north of Memorial Stadium. The university will celebrate the opening of the Howard L. Hawks Hall from 3 to 5 p.m. Aug. 18. Students, alumni, friends and others are welcome to attend the “Open For Business” ceremony as part of Nebraska Business’ annual Back to School Bash. RSVPs to http://go.unl.edu/ywjm are encouraged. Interim Dean Kathy Farrell speaking at the College of Business. Kathy Farrell, interim dean of the College of Business, said the new building emphasizes collaboration and community. The 1,700-square-foot College of Business Husker Shop will house a partnership with Nebraska Athletics and merchandiser Fanatics in which students manage a Husker fan shop within the academic space. The shop’s data will be integrated into curriculum across several majors. The state-of-the-art Trading Room, a simulated stock-trading area, will provide a real-time environment for students to experience what it is like to work in finance. The new 800-square-foot Yes Chef Café and an adjoining 4,300-square-foot atrium space will be open year-round to host large gatherings. Among other features, Howard L. Hawks Hall has a computer lab, a teaching and learning center, eight cluster classrooms and eight case-style classrooms to foster positive group dynamics so students can seamlessly transition between lecture-style presentations and small-group projects. For more information about Howard L. Hawks Hall, go to http://go.unl.edu/2w9t.